The Spherical Plain Bearing GE.ES 2RS Series consists primarily of an outer ring and an inner ring. The inner spherical surface of the outer ring and the outer spherical surface of the inner ring constitute a rolling friction pair. Since the structural form and working mechanism of the joint bearing are completely different from those of the rolling bearing, the joint bearing has its own technical characteristics and maintenance requirements. 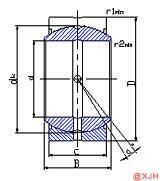 4) Features of structure: With oil groove and oil holes, with an axial split in outer race. With dual seals. 6) Properties: Good wearability, corrosion resistance, self-alignment, dust proof. Spherical Plain Bearing The allowable operating temperature of the GE.ES 2RS Series is primarily determined by the mating materials between the sliding surfaces of the bearings. In particular, the sliding surface of the plastic material of the self-lubricating joint bearing has a downward trend in the bearing capacity at high temperatures. For example, when the sliding surface material of a lubricated joint bearing is paired with steel/steel, the allowable operating temperature depends on the allowable operating temperature of the lubricant. However, for all lubricated and self-lubricating joint bearings, they can be used in the temperature range of -30 ° C ~ +80 ° C, and maintain the correct bearing capacity.